Yes. The tags in Jeti RFID-System can be programmed from transmitter and Jetibox. Works, but it’s a bit slow due Jetibox and sensor doing also a lot of other stuff. Since i had a OLED-display in my million-box I decided to make a RFID Tag programmer. And as it’s done here in RC-Thoughts here’s the code, schematic and instructions shared so you can make one for you. 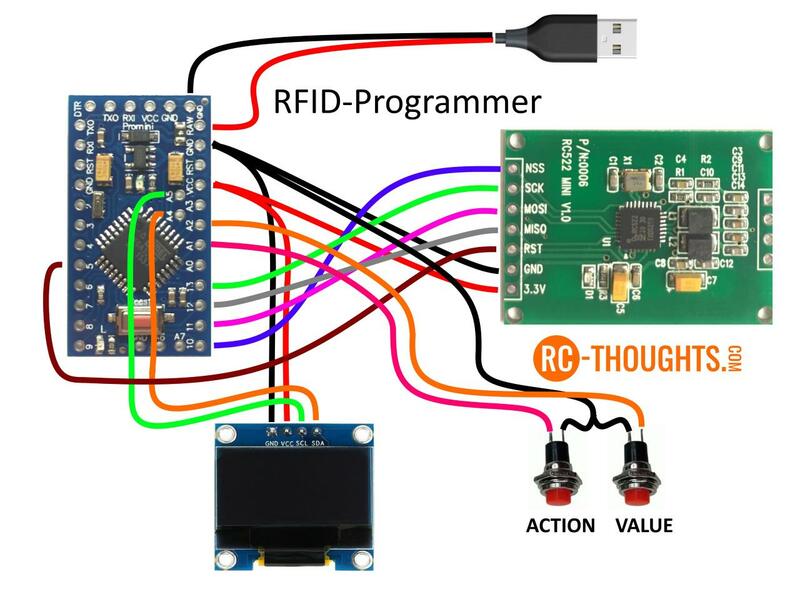 Easy and fast way to program or change values on RFID tags used by Jeti RFID-Sensor. Note about RFID-module: Look pictures below of the sensor (The small green one). The RC522 board and display.module needs to be identical and have SPI interface. OLED-display needs to be I2C with SDA and SCL connection. I’ll admit, there is a few wires to connect here. Just take one at a time and you will be fine. RFID-connection is the same as in RFID-Sensor, Jeti receiver-cable is changed to US-cable, display and buttons added. Go and get the RFID-Programmer.ino file from my Github here. You need to use the libraries included in Github repository. For info on how to use these look in RFID-sensor how-to here. Menus are disabled if there is no tag present, also if you remove the tag in the middle of menu’s programmer will reset to start-logo. I almost did bite the bullet on this one. My first version had wrong resolution on OLED-screen, the screen is 128×64 and I used it as 128×32. After correcting this I ran out of memory on the Arduino, after all it’s only 2048 bytes big and bigger resolution needs more buffer-memory for the screen. So if you want to do some mods always test-compile and monitor the memory-usage. And even if it compiles make sure to test it, there’s some funky stuff on screen when Arduino runs out of memory. Is to have fun building!